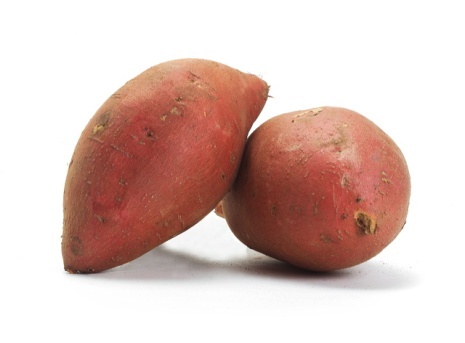 In the United States, the terms "sweet potato" and "yam" are often used interchangeably, when actually they are two quite different vegetables. Available in two primary varieties, one type of sweet potato has dry, yellow flesh and tan skin; the other type has a darker-skin with sweet orange flesh. Causing the confusion, the latter is often erroneously called a yam because of its appearance. Sweet potatoes, not yams, are what we mostly eat here in the United States. To add even more confusion, sweet potatoes and potatoes are two entirely different species and not related whatsoever. Rather dry and slightly sweet, the nearly smooth-skinned freshly cut sweet potato releases a sweetly aromatic scent. Containing about 103 calories, 1 gram of fat and 3 grams of dietary fiber in one-half cup, sweet potatoes offer a source of protein, carbohydrates, vitamin A, vitamin C, thiamine, niacin, riboflavin and potassium. Very versatile in the kitchen, steam, boil, roast, sauté, fry, bake, cream, mash or puree. Steamed or boiled, peeling is up to the chef. Keep completely covered when cooking to prevent discoloring. Peeled sweet potatoes must be put immediately into cold water for the same reason. Pies, muffins, pudding, flans and custards love this vegetable's flavor and texture, too. Season lightly to not overpower its subtle flavor. To store, do not refrigerate. Keep in a single layer in a basket where it's well ventilated, but no longer than a few days. Referred to as the classic yam and much larger than a regular sweet potato, the Garnet is also called the red yam. Quite moist, its orangish-yellow flesh is described as being "succulent" and having an excellent flavor. Encased in a light red-purplish garnet-colored skin, some can grow to be a foot long. Bake, roast, boil, steam, candy, scallop or mash. Add a little applesauce plus a dash of nutmeg, cinnamon and grated orange rind to mashed yams to enhance this versatile vegetable's excellent flavor. Perfect for flavoring pies, cakes and breads. To store, keep in well-ventilated area, preferably a basket. Do not refrigerate. Use within a few days for optimum quality. Containing about 103 calories, 1 gram of fat and 3 grams of dietary fiber in one-half cup, this vegetable offers a source of protein, carbohydrates, vitamin A, vitamin C, thiamine, niacin, riboflavin and potassium. 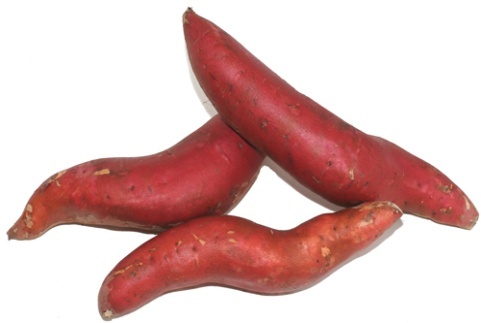 Very versatile, Jewel yams may be boiled, baked, fried to make crunchy chips, grated or steamed. Deliciously flavor cakes, breads and muffins. Candied yams make a tasty side dish, especially during the holidays. Retaining its lovely vivid orange color when cooked, it is a perfect ingredient in recipes where color and appearance are the focus. To store, do not refrigerate. Keep in a basket in a well-ventilated area. Use within one or two weeks for optimum quality.